Oral Roberts University is exploring the potential of real-time, streaming, mobile telepresence tech. A growing number of colleges and universities have been experimenting with emerging virtual reality technologies, such as the Oculus Rift, and the virtual campus tour is emerging as a potential use case. But for the Information Technology Department at Oral Roberts University, the promise of the virtual tour pales in comparison with the potential of real-time, streaming, mobile telepresence tech. "Virtual reality presents too much of a learning curve," said Michael Mathews, chief information officer at ORU. "The telepresence robot, on the other hand, is essentially just standard Web conferencing, but through an iPad mounted on a Segway. People just naturally get it. Students pick it up in minutes, and faculty don't have to go to special training sessions or feel embarrassed about their level of expertise, because the students are the ones controlling it." In April, ORU welcomed two telepresence robots to its Tulsa, OK, campus. Dubbed Geo 1 and Geo 2, the devices were developed by Double Robotics. They combine a self-balancing, wheeled base with a telescoping stem and an iPad the end user provides. The iPad sits atop the stem, which can be adjusted remotely to provide sitting and standing points of view. The students see the campus through the wide-angle lens of a camera mounted just under the tablet, and they interact with that environment via live two-way video and audio streaming. The company claims a six- to eight-hour battery life for the rechargeable device. "It's the closest thing to being here without actually being here," Mathews said. "We're making it possible for potential students to see what it's like to stroll our beautiful campus grounds, walk the halls of our buildings and interact with students, faculty and staff. And it's the next best thing for online students who might never be able to visit the campus." Students wheel the robots around campus and control their movements through a Web connection using software downloaded to their Mac, Windows PC, iPad or iPhones. That software is available free from the App Store, but the robots can also be operated directly from any browser. The telepresence robots themselves recently became available from the Apple Store in the U.S. They're priced at just under $2,500. On the ground (literally), the robots currently need a chaperon, Mathews said, because, although it takes some effort, they can be tipped over, and they can't go up and down stairs — yet. Fortunately, the eight-pound devices can be lifted easily by their escorts to help navigate these kinds of obstacles. Mathews got the idea to try out the robots when he bumped into one at an Apple store. "It piqued my interest, and I looked into how it was being used," he said. "I particularly liked the way it was being used to provide after-hours tours of museums in San Francisco and St. Louis. We know that 80 percent of the students who enroll here visit the campus. Among students who don't visit, that number is closer to 20 percent. The ORU IT department had been batting around ideas about ways to improve enrollment, so we tested a robot with a number of students at campus events, and they fell in love with it. It provided an entirely different experience for them, because they were in control. In the end we said, let's let people take a tour of our campus — our real campus —from wherever they are." But it was probably the quick teacher buy-in that ultimately sold the idea. "The word 'telepresence' resonates with faculty," Mathews said, "and when I talk about the system I use the term flipped telepresence. The faculty aren't broadcasting to the students, as they would for an online course; the students are joining in. The model is flipped." 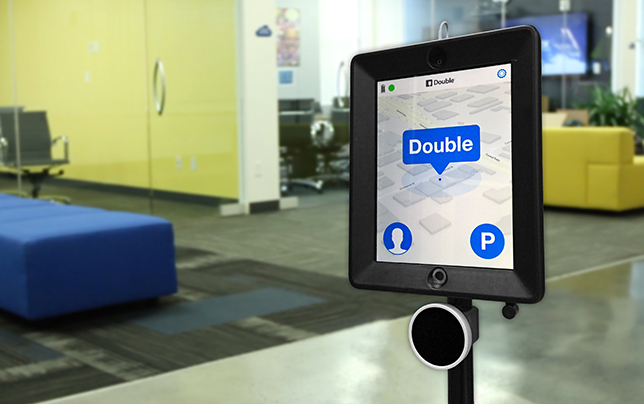 Double Robotics was founded in 2011 and began shipping its first telepresence robot, which the company calls the Double, in 2013. Although the base resembles the self-balancing Segway transportation device, all of the components of the Double were developed and built by the company, said Double Robotics Communications Manager Sara Broyles. Each robot is produced in the company's Sunnyvale, CA, offices, she said, by hand. Since it began shipping its products, the company has sold about 4,000 of the devices, Broyles said. The Double has even appeared in two popular television shows: The Good Wife and Modern Family. Double Robotics is marketing the robots as a next-step telecommuting technology for businesses. They're being promoted in the education market as both a unique telepresence tool for students and money-saving technology for professional development uses. But the range of applications continues to grow across market segments, Broyles said. The company's customer stories page includes a range of examples, from experiments at MIT in the use the robots to facilitate telecommuting, to a cardiothoracic surgeon's use of the device to visit his patients post surgery. Broyles' favorite: the story of a bed-ridden Brazilian computer animator who was able to use a robot to attend a SIGGRAPH conference in Vancouver for the first time. And the Double was very recently used to allow a mother sick with cancer to attend her daughter's wedding in Sonoma Valley. "Essentially, the Double is a set of wheels for your iPad," Broyles said, "and the stories of how people are using it just keep coming." Other universities are also experimenting with the technology. Michigan State University, for example, is allowing online students to use the telepresence robots to join classrooms in real time. 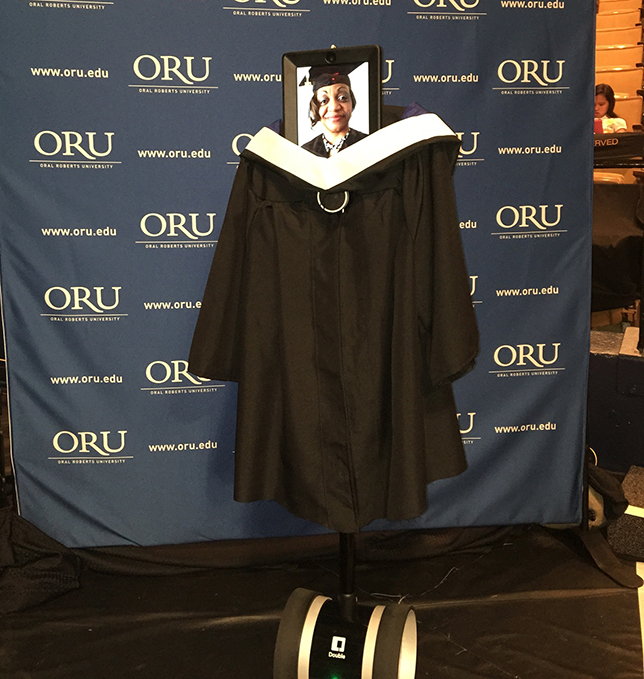 This June, an ORU online student attended graduation via remote-controlled robot. ORU has begun expanding its own use of the telepresence robots beyond campus tours. For example: Noel Magwood, a freshman online student, uses the device to "attend" classes from her home in Miami, FL. And this June, Nocollette Johnston became the first online student of the university to attend her graduation via remote-controlled robot. The university even dressed the device Johnston operated in a cap and gown. "I sat with the robot to make sure that nothing went wrong," Mathews said, "and if you could have seen the smile on her face! She was in the front row, and the president was looking right at her. It was a huge success." At the time of Johnston's graduation, ORU Dean Sergio Matviuk said in a statement, "The robots give online students a wonderful way to connect and interact with the campus throughout their programs. Students who have used the robots tell us that they find it a fun and meaningful way to become more integrated, academically and socially, to the ORU educational experience." ORU chose to rebrand the Double devices, using the name "Geo" as part of the school's overall "GeoVision" technology theme, Mathews said. "GeoVision means global/earth vision," he said. "Our theme to all students for 50 years has been 'reach into every person's world,' from a global perspective." ORU wants to give every student "a personalized vision of the world through technology." ORU has only just begun to use the telepresence robots, so no hard metrics are yet available, but Mathews is confident the technology will prove its value. "We don't have to set up any kind of additional systems to support it," he said. "We just use our existing network. There's virtually no maintenance required. And when you compare the cost to, say, what it costs students fly here from other countries (we have an international base of 85 countries), it's very affordable."